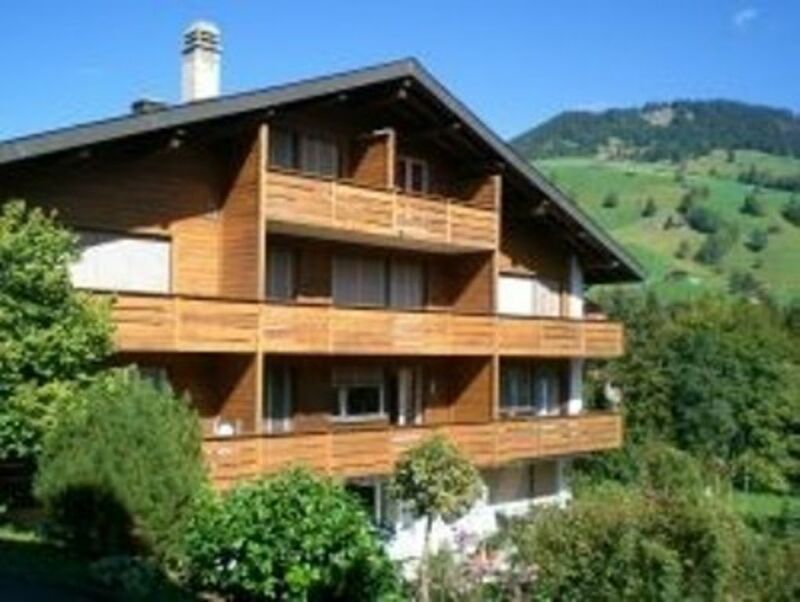 Beautiful 3 1/2 room apartment in a multifamily chalet in Habkern, just 7 km if Interlaken in the Bernese Oberland. Well equipped kitchen, large living room, 2 separate bedrooms, bathroom, separate toilet, balcony. Shared washer and dryer, Private parking. Beautiful, quiet location, surrounded by greenery, View of Mountain Opposite. Altitude 1100m. Bus stop 100m, shops 400m, restaurant 50m, ski lifts directly and 500m, swimming pool 500m. Fishing, rock climbing, mountain hiking, paragliding, swimming, golf, jogging, bowling, rock climbing, paragliding, cycling, rafting horseback riding, skating, swimming, sailing, alpine-skiing, cross-country skiing, diving, tennis, hiking, windsurfing and more. Child-friendly, baby equipment, pets allowed by arrangement with the landlord, Non smoking property. 1 double bedroom, 1 bedroom with bunk bed and single bed (for 3 people) Extra bed and cot possible. Living room, dining room, 1 full bath and separate toilet, balcony. Well equipped kitchen: gas cooker - hob and oven, microwave, refrigerator cooling / set refrigerator combination, coffee maker, toaster, kettle, dishwasher. Plumbing: bath, shower, sink, hair dryer, hot water. Getting there; Bern / Luzern until exit Unterseen / tuna / beat Bert. Then direction Interlaken and afterwards direction Beatenberg / Habkern. Right Turn off towards Habkern. Driving in Habkern to the village end and branch off in front of the Sport Hotel right. The settlement 'In Zäundli' is located immediately to the left. Drive to the small parking lot and House B is to the right. With the tourist tax, the guests receive a guest card, which includes free admission to the swimming pool, free use of the public transport system according to the network and other benefits, which you will find in the brochure on arrival. Tourist tax: CHF 4.00 per night for adults, CHF 1.50 per night for children over 6 years. We needed main floor accommodation for one member with accessibility issues and there were a few more steps to the main floor than we anticipated. The tub shower was an issue as well. This really was our fault for not checking further with the owner. Otherwise it was a lovely adequately equipped apartment in a beautiful Swiss mountain village. We enjoyed our stay. Very spacious and clean, smart challet. We found the vendor very friendly and the challet was excellent. The public swimming pool 30 mtrs up the road is a blessing in the hot weather. Clean rental in a beautiful little town. Loved Habkern and this place was great! Thank you very much for the kind feedback. I am very happy that you enjoyed your stay and liked our place. Clean property in nice setting but a bit remote. Good value for the money if you have a car. Very nice, spacious apartment in a great location. I hope that you had a most enjoyable time in our apartment and the region. Thank you for you positive feedback. We appreciate this very much. Staying in the apartment was such a wonderful experience...from every aspect, which made our Swiss tour extremely memorable. Scenic surroundings, specious rooms, neat & clean interiors, & fully equipped kitchen made our stay very comfortable & satisfying. Hope to get an opportunity to enjoy the stay at the same apartment in future!!! Habkern with about 650 inhabitants, is a typical mountain village (1100m.ü. M), protected from the wind and fog. Habkern offers its visitors quiet but enterprising numerous opportunities for hiking and biking, the heated swimming pool splashing, play tennis, enjoy the beautiful mountain flora and watch Steinbockkkolonien in the wild. In winter there are two ski lifts and it is ideal for cross-country skiing. Habkern is also suitable as a starting point for larger excursions in the Jungfrau region, the lakes Thun and Brienz and mountain passes. The Jungfrau region is famous for countless outdoor activities. In summer, the rates for experiences and adventures include beautiful mountain excursions and hiking. With family visiting the natural wonders such. B waterfalls, caves, or make a trip to Bern, the capital of Switzerland. Golf: For golfers there is a golf course about 10 km from Habkern. Ski: Winter sports enthusiasts can enjoy themselves in this region in different ski areas. Numerous ski and SNOBOARD slopes, cross-country skiing, sledding, hiking and excursions, for example to the Schilthorn or Jungfraujoch give the visitor a fantastic choice. In Habkern, a children's ski lift is directly in front of the house and another ski lift only 500m from the house. For cross-country skiing, it is ideal. Mietpreis: in Schweizer Franken - Kreditkartenzahlung nicht möglich Bis zu 4 Personen: CHF 100.00 pro Nacht & CHF 150.00 für Endreinigung/ Bettwäsche - wöchentlich CHF 850.00 6 Personen: CHF 120.00 pro Nacht & CHF 180.00 für Endreinigung/ Bettwäsche - wöchentlich CHF 1020.00 & Kurtaxe: pro Tag CHF 4.00 pro Erwachsene / CHF 1.50 pro Kind von 6 Jahren Wöchentliche Belegungen sind vorziehbar.